Ready to be placed on the tabletop! Made from high quality resin & plastic and beautifully painted, this set includes one (1) linear hedge wall with an urban styled stone planter. You can choose for the hedge plant section to be painted or even flocked. The urban hedge fence enhances your Outdoors or Urban Tiles; or can used with gaming surfaces you already own. 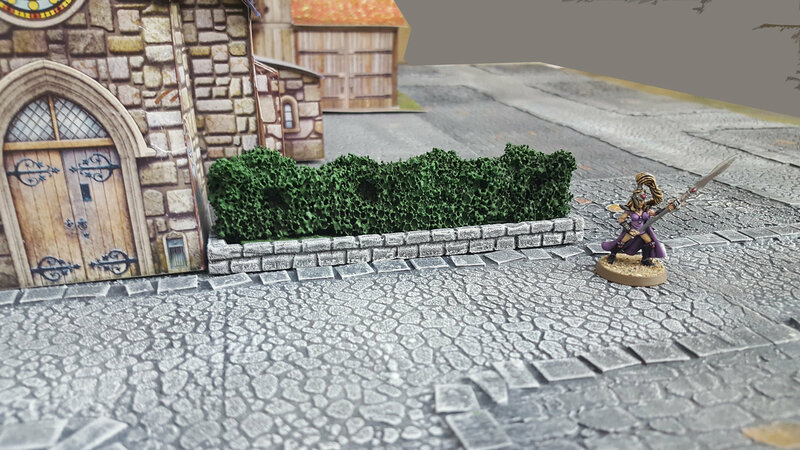 The completely revamped and redesigned Pedion hedges can be used in any Fantasy, Ancient, Medieval and Modern environs, and in scales from 25mm to 32mm. Each Set includes 1 urban hedge section of 15 cm length, 3cm thick and 3~3.5cm high. Great for Age of Sigmar, Kings of War, Frostgrave, Bolt Action, Warzone, Infinity and Runewars wargames, as well as role playing game sessions.